Rimfire 322 - Pocahontas Sunrise. Faces the slopes, in the village. Sunrise every day! HEATED PARKING GARAGE, PRIVATE SKI LOCKERS, ELEVATOR BUILDING, STARBUCKS LOCATED ON LOBBY LEVEL! Rimfire is that perfection location for your vacation. Right in the heart of The Village, close to all the action. Enjoy a fresh cup of coffee at Starbuck's, dine in one of our fine restaurants, relax in one of the hot tubs located in the complex, or walk to any of the many activities going on. 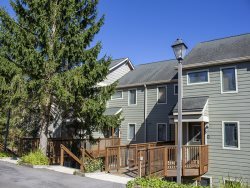 This unit is equipped with a full kitchen, gas fireplace, sleeper sofa, and two TV's. Book this adorable unit for your vacation today.